I’m excited to let you know that I’m the guest on this week’s FUJILOVE Podcast! During this episode, I talk with Zürich based street and documentary photographer Jens Krauer about, cameras, creativity, passion, the power of still imagery, Fujifilm, shooting aerials from the open window of my 1947 bush plane, my own journey with photography, my passion for teaching fellow Fuji users and what it takes to be a pro photographer and successful blogger in today’s world. I also discuss my forays into shooting video, which is a very new thing for me. Having just shot my first professional video project using the X-T3, I share my thoughts about shooting video vs stills and where I see myself going with this now that I’ve peeked into Pandora’s Box. 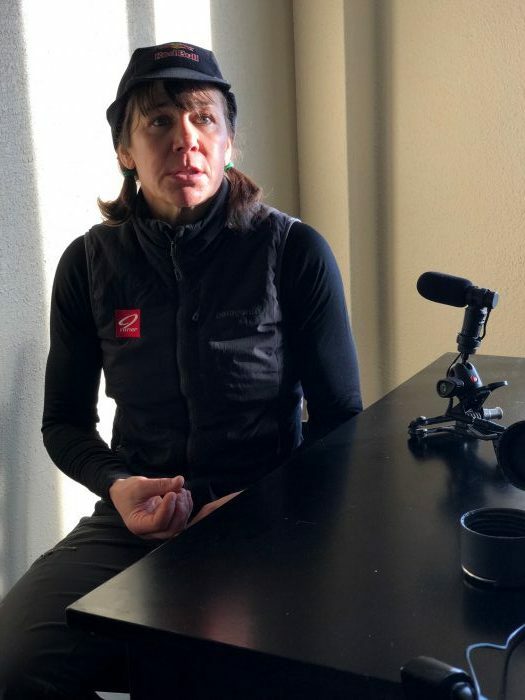 I really enjoyed my extended conversation with Jens, we dove into a wide variety of topics. In fact, after we finished recording the episode last month, we continued our discussion for another 45 minutes. 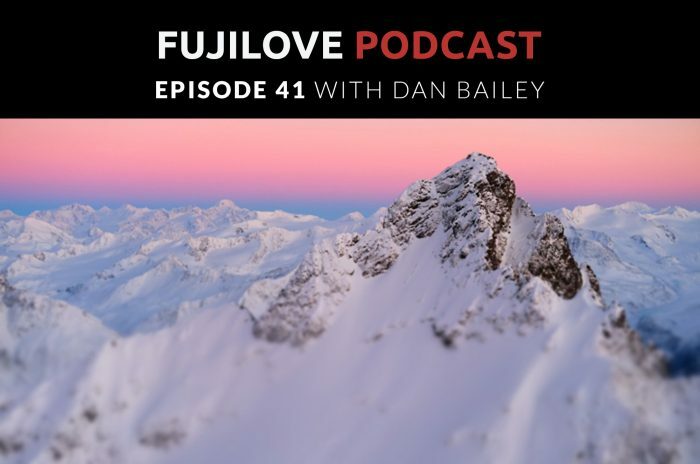 FUJILOVE is without a doubt one of the best online resources for Fuji shooters and so I’m psyched that they were finally able to fit me in on the podcast. Listen to the interview here, then spend some time cruising through the archives and consider subscribing to the monthly FUJILOVE Magazine. If you’d like to listen to other podcast interviews with me, you can visit the archive page here. 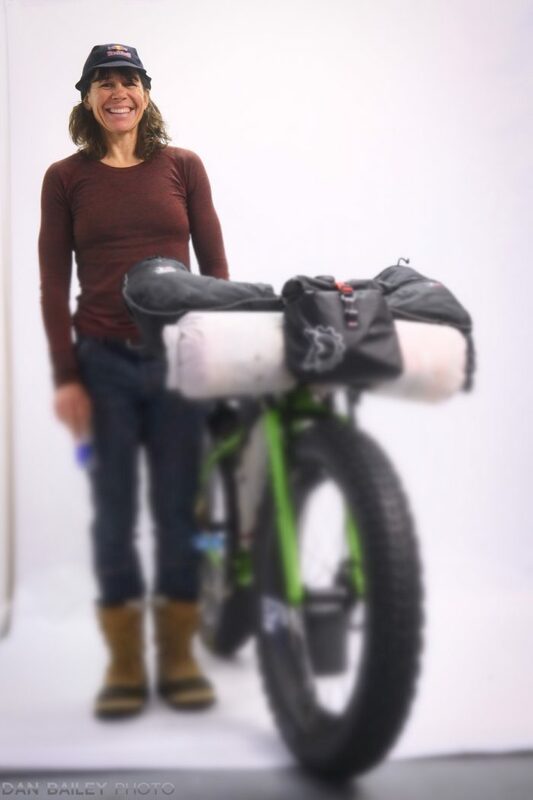 I was prompted to write this post after waking up and seeing a familiar photo staring back at me on the Revelate Designs Instagram feed this morning. 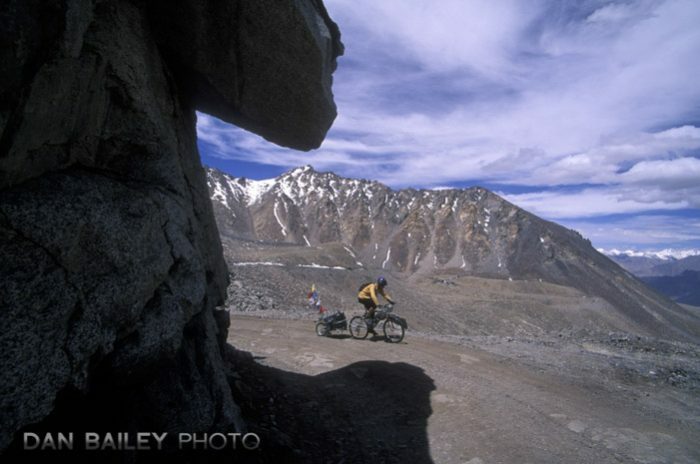 It immediately sent me back down memory lane, because I shot this photo in July of 2001 during a mountain bike touring expedition to Ladakh, India with my friend Eric Parsons, who is currently celebrating the 10-year mark for his company that makes bike bags. Eric lived around the corner of me in Fort Collins, Colorado, back when I was a budding professional photographer. 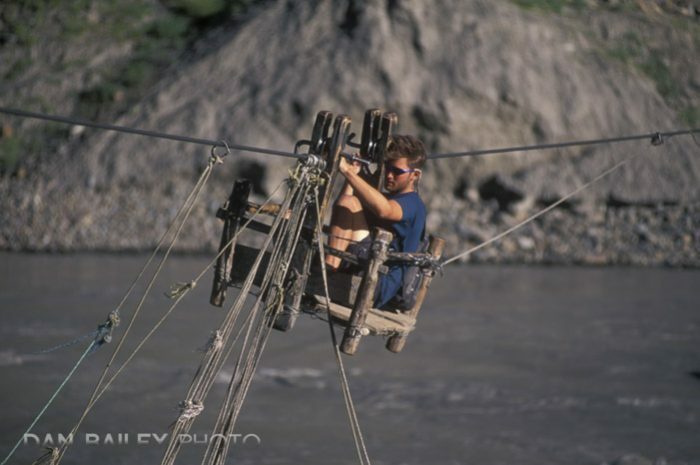 I met him around 1998; he was the housemate of Pat Goodman, who was one of my main climbing partners. At the time, all I knew about Eric was that he liked to ride his bike. Apparently, he would wake up, shove a bunch of food in his mouth, most of which consisted of peanut butter & banana sandwiches, then go pedal for about four hours around Horsetooth Reservoir and Lory State Park. Then, he’d come home, take a nap, shove more food in and go for another ride. Or else, make bread. A talented baker, Eric is a devotee of Daniel Leader, master baker and owner of Bread Alone in the Catskill Mountains and back in those early days, Eric spent a lot of time experimenting with recipes and making some very tasty loaves. This was a big plus for me, especially during those few months when he crashed on my couch after our India trip. I started hanging out with Eric more often and we hit it off like long lost brothers. We spent a lot of time mountain biking, hiking around Rocky Mountain National Park in ridiculous conditions, and always trying to come up with even more ridiculous and stupid adventures to challenge ourselves. 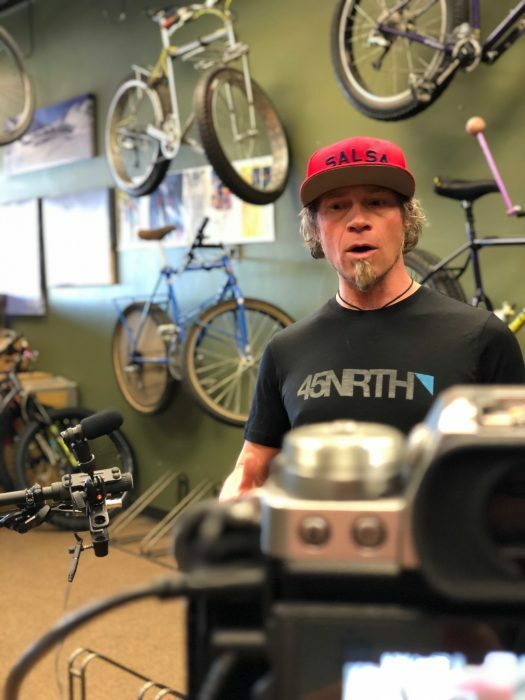 I remember one particular morning when he tromped down the stairs to my basement apartment and announced “Let’s go destroy ourselves,” as he proposed a 50-mile VERY hill road bike ride up Buckhorn Canyon, a road that features some notoriously steep hills. I gladly obliged, because hanging out with Eric made me stronger. And because he’s such an awesome partner in the outdoors. One of my favorites adventures was our 10-Mountain Traverse in RMNP. I had the idea that we could start at Long’s Trailhead and hike Meeker, Long’s, Pagoda, Chiefshead, McHenrys, Powell, Taylor, Otis, Hallett and Flattop. Ten peaks, about 30 miles and thousands of feet of climbing. 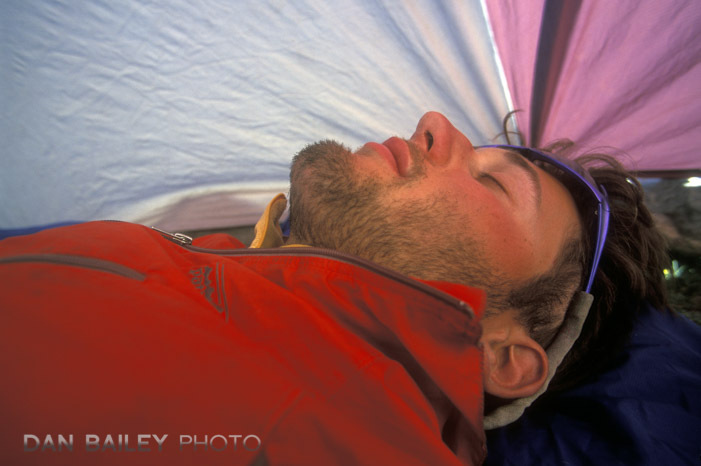 Aside from the small fact that I ended up getting caught in the fog on Flattop Mountains and ended up sitting down and bivy-ing in the rocks all night so as not to accidentally wander off the sheer north face of Hallett Peak in the dark, we were successful, elated and extremely tired. If I hadn’t stopped, we would have made it in 24-hours. Then there was the time that we tried to hike up to the top of Long’s Peak on the evening of December 31, 1999 to watch the all the Midnight New Year’s fireworks on the front range when the year 2000 hit. Unfortunately, Eric had injured his shoulder earlier that day, so between that, and trying to slog through heavy snow conditions up high, we barely made it above treelike before retreating, trying to sleep in our respective, freezing Toyota truck beds, and finally saying goodbye and driving back home. By the way, we both still have our same trucks, and they still run. About eight months later, in the summer of 2000, I was shooting on a big photo/TV commercial travel assignment in New Brunswick, Canada. 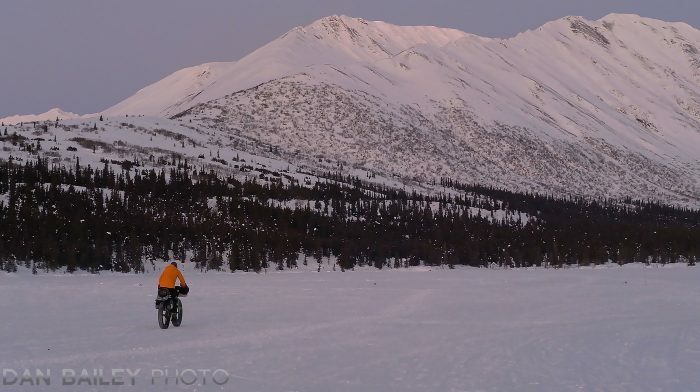 One of the film guys named Paul was an avid motorcycling touring enthusiast, and he’d often to big tours after finishing up on big projects; movies like Titanic, Delores Claiborne, The Shipping News and K-19: The Widowmaker. 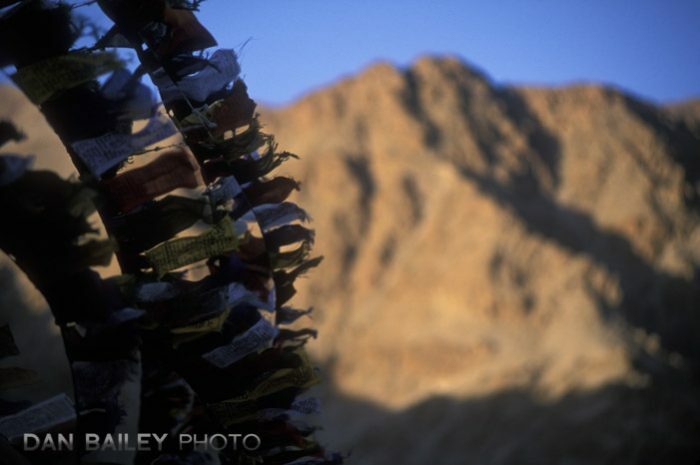 Anyway, one evening Paul showed me pictures he’s shot the previous summer while motorcycle touring along the world’s highest road in a magical place called Ladakh, India. I was fascinated, and that evening, I called Eric on the phone and said, “I know what we’re doing next summer!” Never mind that neither of us had ever done a multi-day bicycle tour. 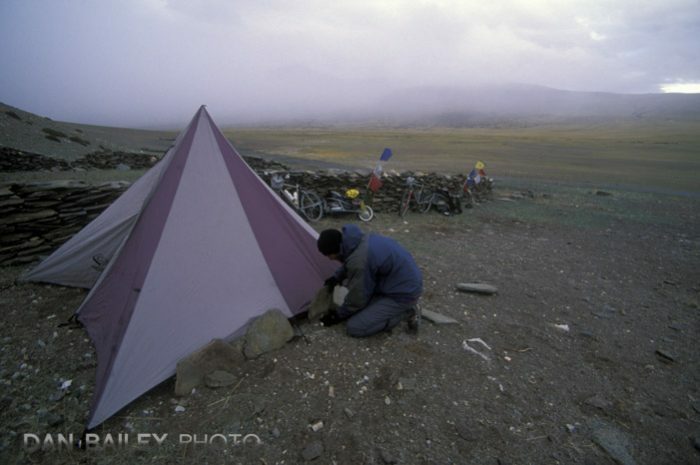 We figured that we knew how to pedal long days and we knew how to camp and endure horrendous weather. How hard could it be? The next summer, we flew to New Delhi with our bikes in big plastic cargo cases, took a 17-hour bus ride along swerving mountain roads up to the town of Manali and spent the next month biking the Manali to Leh Highway, a 300-mile, mostly unpaved, often bumpy, occasionally treacherous and generally bad stretch of road up into the capital city of Ladakh. They use the world “highway” quite loosely. 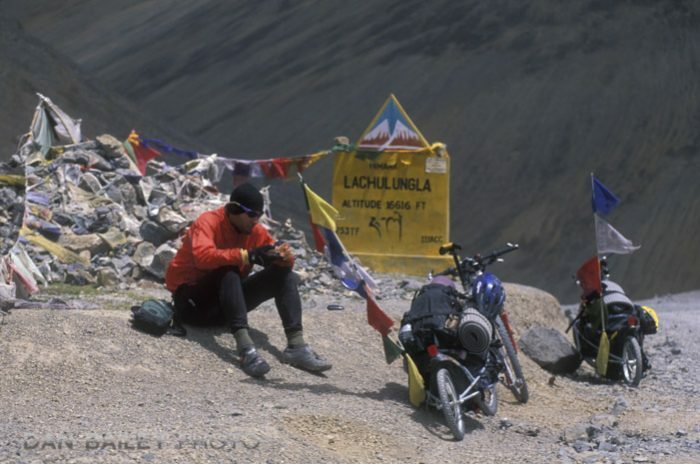 Along the way, the road crosses a number of high passes, including the Rotang La, at 13,060′, the Baralach La at 16,500 ft, the 22 hairpin Gata Loops and Nakee La pass at 15,547 ft, the Lachlung La at 16,616 ft, and the Tanglang La at 17,480 ft, before dropping into the Leh valley, which sits in an arid plain just below 12,000 ft. 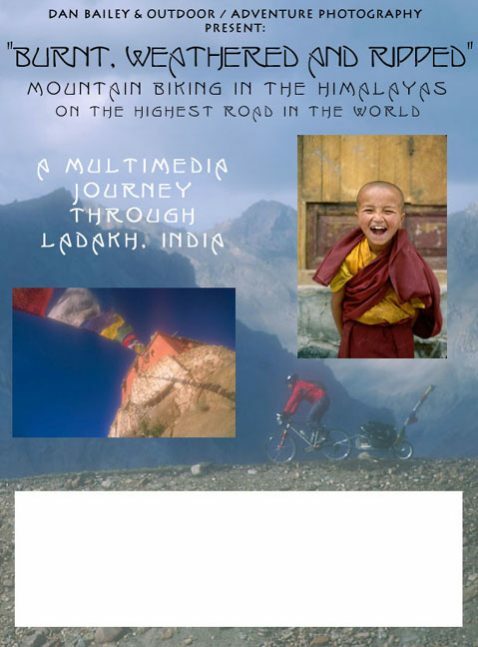 Beyond Leh, we pedaled up and over the world’s highest road pass, the mighty Khardung La, at 18,380 ft, and down into the Nubra Valley, where I shot my photo of the little laughing lama at the Diskit Monastery. I’ll just say that it ended up being really freaking hard. Over all of this, I carried my Nikon N90s, a handful of lenses, including the 3 lb. 80-200mm f/2.8D and two Ziploc bags filled with 80 rolls of Fuji film, mostly Velvia. 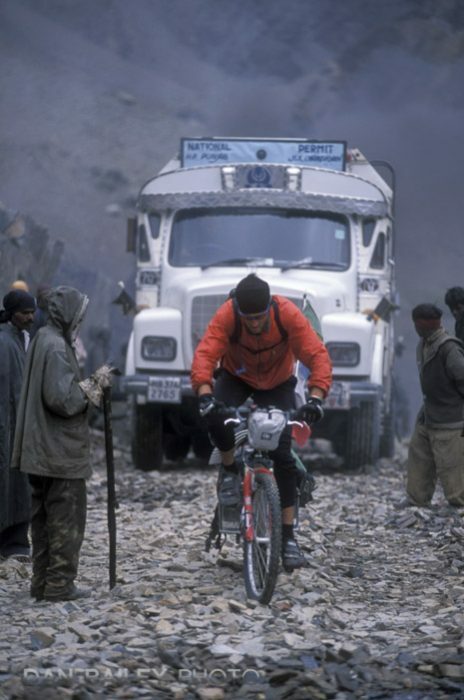 To this day, I look back on our India bike trip, seventeen years later, as the greatest adventure of my life. It checked every single box, and having ridden our bikes along this amazing route before digital, before cell phones, before social media, before Instagram, before drones, before YouTube, before Strava, I simply cannot see ever topping this…although I continue to try. 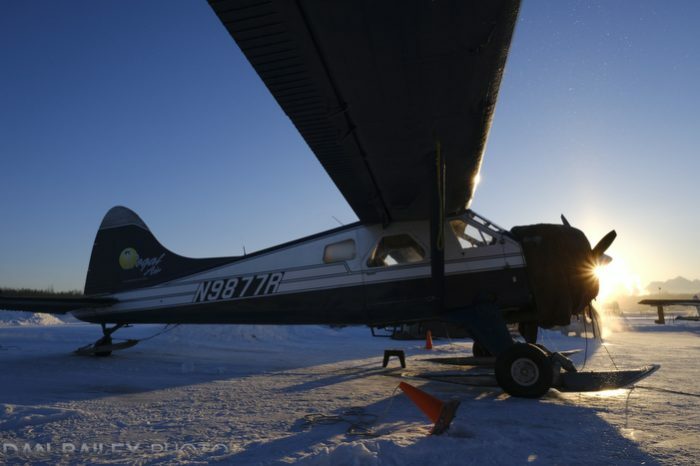 Eric and I shared a truly bonding experience during those few weeks backing 2001, and although we’re still fast friends, and oddly enough, still neighbors once again in Anchorage, Alaska, it’s funny how rarely we see each other or do anything together outside. Self employed. Wives. Dog. Cats. His little boy, Finn. Bad planners. You know how it goes. We try, though. After we got back, I did a number of slide shows and sold quite a few photos from the trip. 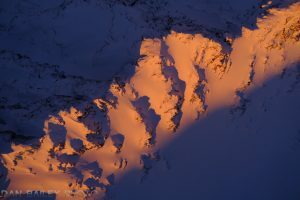 Patagonia has used quite a few in catalogs over the years, and even chose one for their book Unexpected: 30 Years of Patagonia Catalog Photography. This trip did a lot of for my photography career and to this day, Eric is my most published model of all time. He’s been in numerous catalogs, magazines, book covers and calendars. And of course, my experience on this adventure gave me the confidence and inspiration for doing more bike trips in other parts of the world. It ignited a true passion in me for exploring and photographing the world by bicycle. I’m still riding bikes with my cameras, only the biking gear has gotten way better and my cameras are a a lot smaller now. After this trip, Eric swore off trailers. 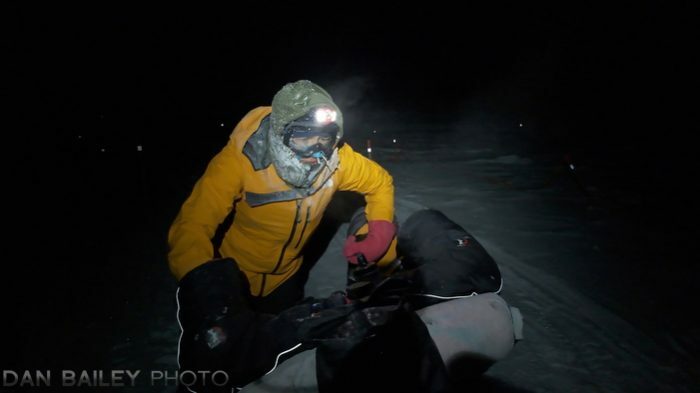 He broke his during the trip, and after a bad welding job in the village of Keylong that quickly failed, we finally fixed it with a hose clamp and carabiner. He’s always been hard on his gear, but as it turns out, that’s a good thing. 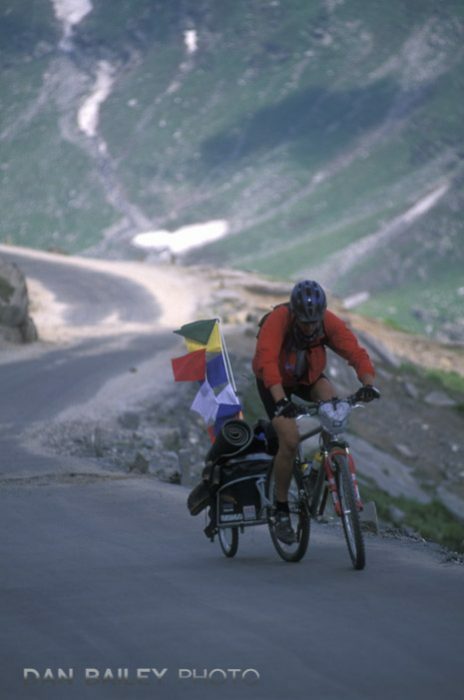 During the next few years, he started tinkering with different ways of carrying things on a bike. 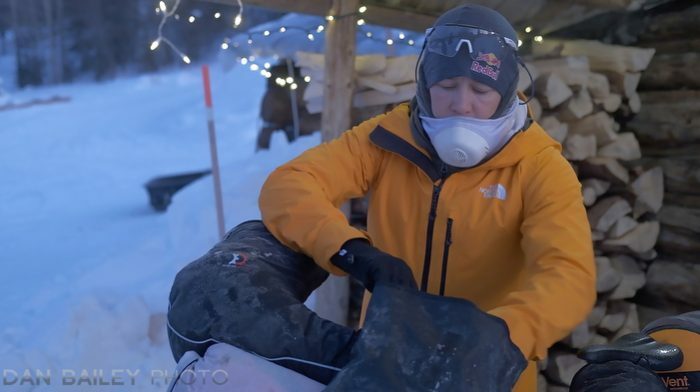 Eric moved to Alaska, started sewing his first frame bags and selling them to local ultra racers. When his backorders reached about 100 pieces, he decided to quit his job as an engineer and start his company. 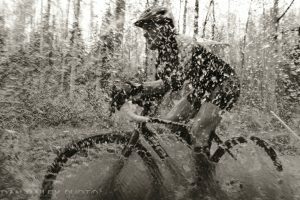 This month, Eric is celebrating the 10-year mark for Revelate Designs. It’s amazing to see how far he’s come and the incredible impact and influence his ideas have had on the industry. 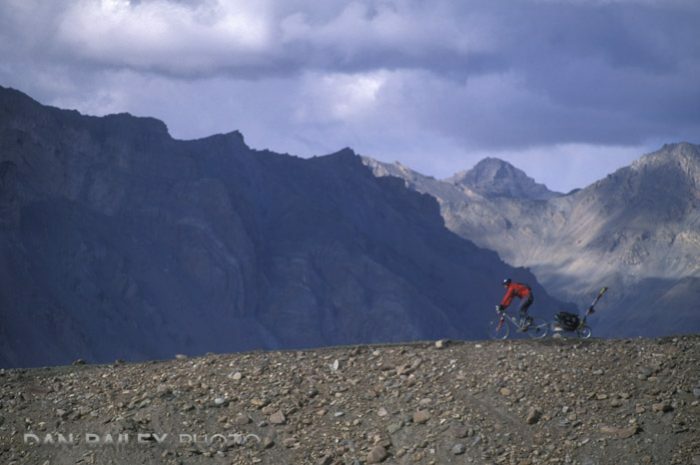 Back then, we just called it mountain bike touring. 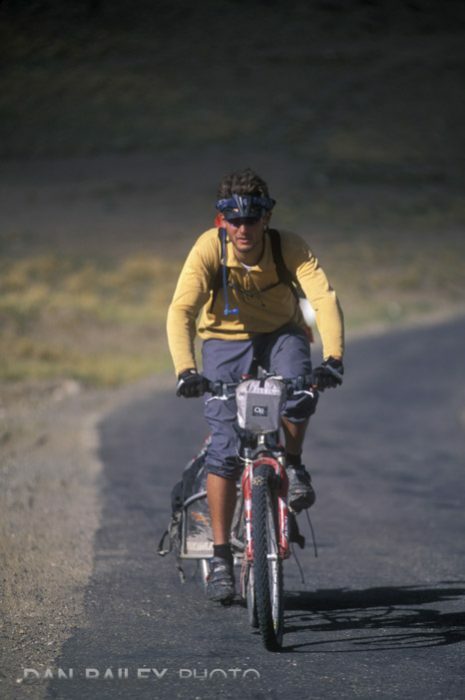 Now, the term is “Bikepacking,” and the entire concept was pretty much invented and made popular because of Eric and his designs. They even sell his stuff at REI. As with any industry, there are tons of copycat companies who sell similar gear, but there is only one Eric Parsons. His ideas, innovations and product engineering are second to none and he continues to be the leader in this industry. 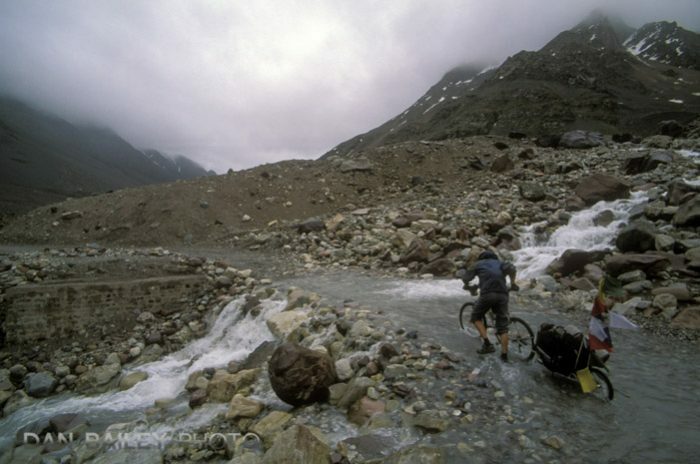 Whether you tour on or off-road, there is simply no better way to carry stuff on your bicycle. I would like to dedicate this post to Eric and congratulate him on his 10-year mark. Having just hit my 22-year mark for being self-employed, I know how big a milestone that 10-year mark is. I’m excited and proud of my friend, I’m proud to be one of his ambassadors and I’m excited to see where his ideas take him in the next phase of his career. 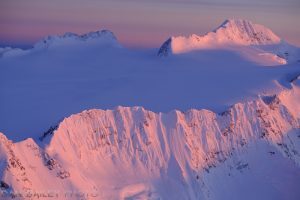 We moved to Alaska right after he quit and started sewing full time, in fact we even lived with him for a few months and helped him cut fabric in the garage. 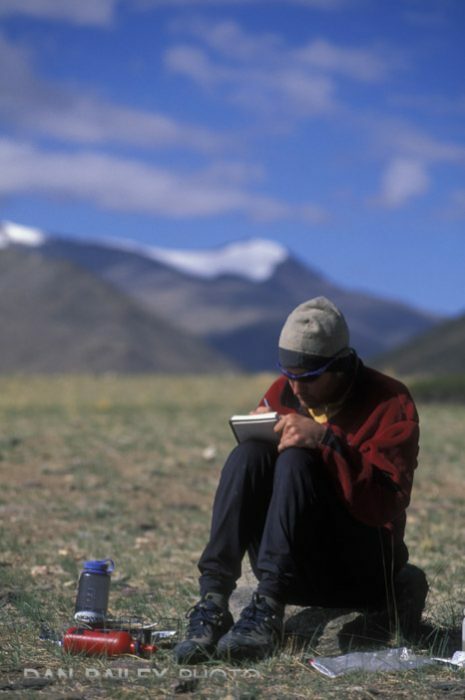 It’s so cool to have seen Revelate Designs grow from the very beginning, and even before the beginning, when it was still just a seed of an idea formed on those bumpy roads in Ladakh. 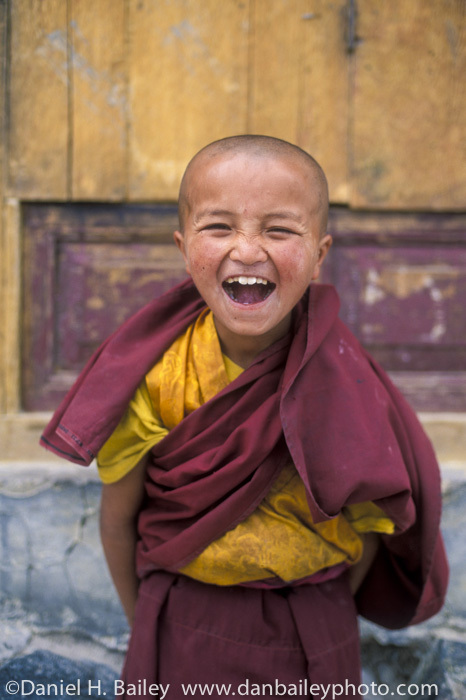 More than anything, though, I smile when I see the guy in all these pictures and think about our India trip. It’s so cool to remember riding our bikes over the highest road in the world so many years ago and see where that experience has brought us. Congratulations Eric, here’s to you and your success! I look forward to sharing more adventures with you in the future. 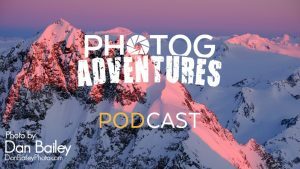 I’m a Guest on the B&H Photography Podcast This Week!